The resort's plantation style rentals have much more character than many chic modern hotels. Take a gentle paddle board cruise with your loved ones, or lie back in the sun. The award winning Sea House restaurant serves gourmet farm-to-table specialties. No need for a tour boat, walk into an amazing underwater world, right from the beach. Take a dip in any one of the resort's four pools or soak in the Jacuzzi. 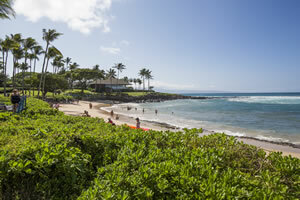 You're step from Napili Bay, one of the most famous beaches in Maui. One of the best snorkel and boogie boarding beaches in Maui. Play at the famous Bay Course or Plantation Course at Kapalua Golf Club. Admire the sunset over the ocean with a romantic dinner at Sea House restaurant. All condos face the deep blue ocean and tropical gardens. This calmer, quieter resort is tucked away on the laid-back shores of Napili Bay. “Quiet time” from 10 pm to 8 am everyday ensures an exceptionally peaceful stay. Wake up slow and wait for the complimentary coffee, tea, and fresh pineapple served at 10 am each morning by the beach cabana. Spend the day at one of the resort’s four pools or on the beach at Napili Bay. Here you’ll find great snorkeling, boogie boarding, and stand up paddle. Then soothe your muscles at the boutique spa with a massage and body treatment. Enjoy lunch and dinner at the Zagat-rated Sea House restaurant, which was named the “Most Maui-est Restaurant” and best bar by Maui Magazine in 2014. Napili Kai is the perfect choice for those looking for a quiet beach vacation rental in a resort with authentic Hawaiian charm, away from the fast-paced resorts of Ka’anapali. Many come for the calm waters and intimate vibes of its pristine crescent beach, others for the fine dining and golfing of ritzy Kapalua. Overall, the refreshing air in this bedroom community feels cooler and quieter than the rest of Maui.